We're so used to dealing with computers via opaque and inscrutable applications and services, that it's hard to imagine any other way. This model has also dominated the Web and smothered the key ingredients that led to it sweeping across the planet: links to stuff and standard types for publishing it. The Object Network revisits the promise of the Web and allows us far greater visibility and control over our digital lives. So, imagine you had just a single user interface giving you a view into your digital world, and presenting you into that world with a single identity. You could see your family and friends in that world, and chat with them and see their latest news and photos. Like the Web, you have links - people have links and their chat messages and photos all have links. Avatars and palaces in a virtual world and lights and sensors in your home can all be linked up and seen in the same user interface or digital world view. You could jump from object to object via their interlinks just like on the Web. Everything would work together, you can use links to wire things up any way you like, even if the things you're linking to are hosted by completely different people, or are hosted by you on your own home devices. You could create a list of links forming an album of photos that you like that are published by different family members. Objects could link to, build on or borrow from other objects or sets of objects, either on your own device or remotely online. You could build on objects created by someone else on your WiFi network, and they could reuse your stuff in turn. You could actually link directly to an application or object set running on your sister's home hub which may in turn be borrowing stuff on your AR glasses via links. As well as wiring things up to create new behaviour, you could configure pre-assigned object behaviours. When you follow a link, what you see will keep on updating in sync with the original. This is "live" data. Instead of always copying stuff and losing updates to the original, you'd be able to use links to keep synced. If you linked to a 3D house that your friend built, you could create a street of houses from that link, and when she improves it, the whole street looks better. Further, things on links continue to be interactable, only now remotely. Everything looks the same and interacts the same if it is the same: photos are always just photos, messages just messages; all common types of things in this world are commoditised. Thus there is just one map, and you can plot lists of links to photos or contacts on that map, or anything else with a geo-coordinate, from any source. As someone or something moves around, you could see it move on the map. You would be able to create, wire up and publish your own digital stuff, to share links to your own objects on your own devices and link in turn directly to others' on theirs. You would perhaps see adverts attached to certain views, and could pay for stuff you wanted, but most things would be free. Everything, whether paid or free, could be shared directly between people without intermediaries. Sharing is no harder than passing a link to someone with read-only or interactable permissions on it for them. You'd know what was yours and what was someone else's. You own your own stuff. There will be a system of ownership and permissions. You could allow people to just view or read your stuff, or allow people to interact with it. Everything would be out in the open and visible, you'd have handles on stuff via their links, you'd be in control. You'd be able to write simple rules yourself to animate your own digital property - to build more than just static structures out of linked-up digital stuff, but fully interactive and dynamic applications of your own imagining. This way of organising the digital world is similar to reality itself - things behave in expected ways, they persist and then keep on changing, they interact in predictable ways, anything can be joined to anything else, things can be manipulated by normal people, new things can be built on existing things and made to behave how we like. The Object Network models the real world and the virtual world using dynamic, autonomous, interacting 'objects'. Things (lights, sensors, switches) are objects in the Object Network. 3D blocks, materials, structures, voxels, regions, cows and pigs are objects. Contact cards, calendar events, photos and messages are objects. You are an object! Everything, every item of virtual property, every object in the Object Network has an identifier or link called a UID - like a web URL - including you, including almost anything interesting around you. Objects have properties or state and can broadcast their state updates to other listening or observing objects that link to them. There are wearable devices such as smartwatches and AR glasses. These can host a "you" object that observes linked objects on your behalf and understands how to render what it sees. Other objects are hosted in other devices, and all of these communicate the changes in their hosted objects directly, 'peer-to-peer'. Anyone can animate (program the behaviour of) an object they own - i.e., how it reacts to the state updates of peer objects it's observing - using simple rules that declare how the state of the observer depends on the state of those peers. 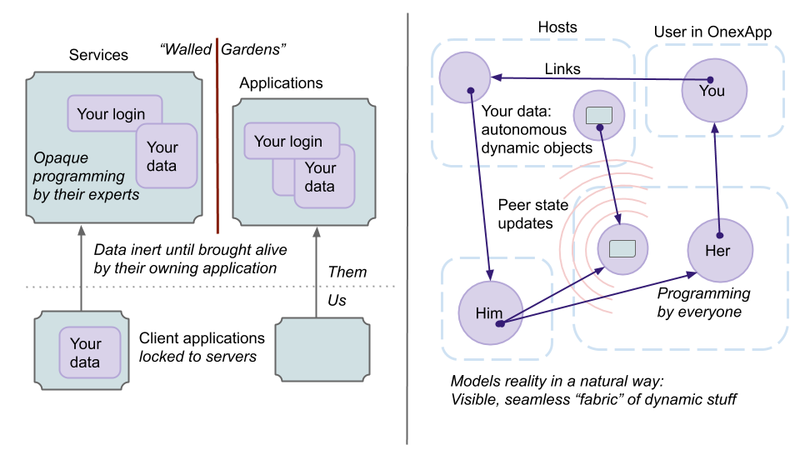 Instead of applications controlling inert data, the Object Network breaks everything down into these self-animated autonomous objects, distributed on hosts that publish them on UIDs, interacting directly. These UIDs can be picked up either via other objects, or directly from the environment. For example, the light UID could be picked up from a Bluetooth beacon on the light, the price tag UID from a QR code stuck to its physical manifestation. These could map nicely to an Augmented Reality view of your surroundings. Having no more applications and no more lifeless data means you no longer have to load, save, download, refresh, upload, submit, send or share stuff, except via links and observation. Nor do you need to upgrade or restart apps. Like in real life, everything just keeps on running and interacting and evolving. Including the object rules themselves: you can update a rule and immediately see the effect. An object simply links to its animating rules, which are themselves just more objects. The Object Network models reality in a very visible, tangible and natural way; ready to merge seamlessly into it. It replaces applications, services and inscrutable central control with an open mesh of visible objects whose overall behaviour and interactions emerge across the network - just like in reality. This visibility and natural behaviour of the blended real and virtual environment enables control over it to be returned to its owners.